1. Using a basic nine value scale, with 0 being the lightest and 9 being the darkest, use 0-1 for highlights and 8-9 for darkness of the ridge and thick areas of the glass. 2. Don’t forget that glass has thickness. Make sure that when you draw the shapes of the object, draw out the thickness of the glass as well. 3. Glass has shadows. Even the transparent objects have shadows. This can be easily forgotten by beginners. 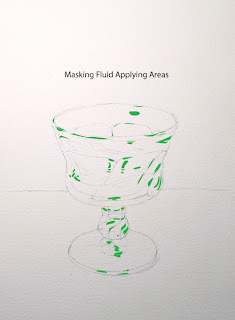 This demonstration is going to focus on painting a clear glass in watercolor to demonstrate how to paint transparent form. Today, we will paint a glass object with complex shapes in a step by step process. 1. Start with the drawing. Mark the highlights and reflections to make it easier to paint later on. 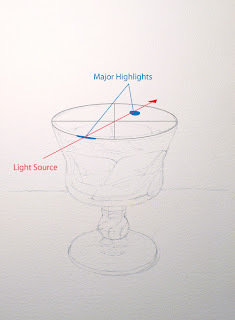 Here is a little tip on marking the majors highlights of a glass in the drawing. 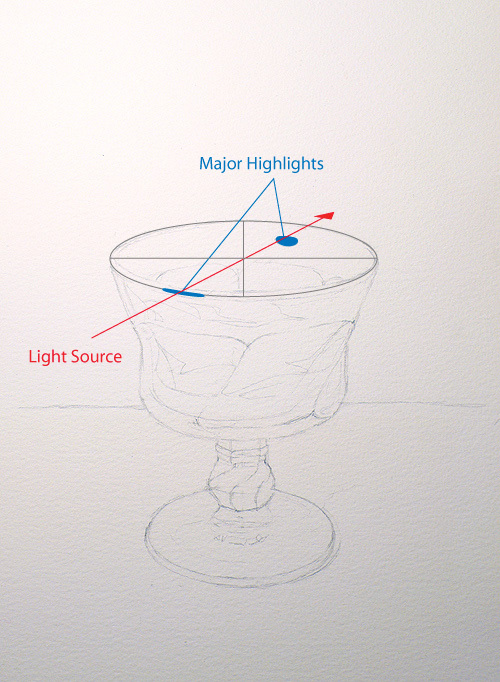 When using one single light source, two major highlights will appear on the axis of the ellipse. See the image to the right. 2. Apply masking fluid on all the highlights and reflections in the glass. 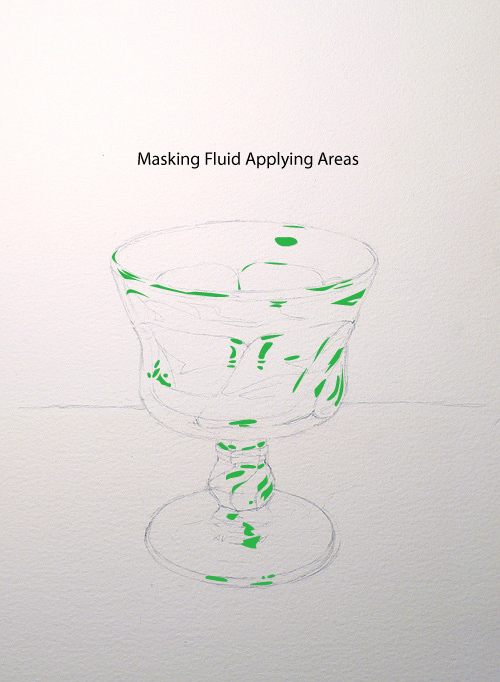 See the green areas on the image to the right for the areas applied with masking fluid. 3. Apply the first wash. After allowing the masking fluid to dry, wet the whole paper with clean water. While the paper is still wet, paint a bluish gray to create the form shadow and the cast shadow of the glass. Wait for it to completely to dry. 4. Apply the second wash. On the second wash, darken the cast shadow a little bit more, paint a light warm grey on the glass giving the area little color to suggest the glass, and paint a light warm yellow wash on the foreground to suggest the color of the light source. Wait for it to dry. 5. Paint the background. Wet the background area with clean water and apply the turquoise blue to the background. 6. Paint the mid-tone of the glass. Use a detail brush to paint the mid-tone areas of the glass. These mid-tone areas are basically the distortions of background and foreground. So, use similar blues from background on these mid-tone areas to ensure a successful merging of the glass to the environment. If the colors are too different, the glass might look out of place. Paint the bottom using similar colors to the table also. 7. Paint the second layer of distortions. Paint another layer of distortions with colors that are little darker than the last step. 8. Paint the last layer of distortions. Use colors that are equal in value to the 8-9 values on a nine value scale to paint the last layer. This will visually pop the glass out and indicate the thickness of the glass nicely. After it is completely dry, remove the masking fluid. 9. Apply a light wash over the reflections that are on the shadow side. After removing the masking fluid, I felt that the reflections on right side of the glass were too bright because, technically, these reflections are still inside the form shadow of the glass. So, I painted a light bluish gray wash over the reflections to the right to tone them down just a little. In this demo we used masking fluid to create the crisp and clear highlights of the glass and subtle variations of color to suggest transparent form. Using the ideas above will allow us to paint transparent form by focusing on placing the highlights and the thickness of the transparent surface in the correct places. Always wondered how to paint trsnsparency. This has encouraged me to have a go. Thanks for sharing. thank you for taking time to put this together for us less capable mortals!